The external floorings are generally arranged in two main groups – for industrial and decorative use. The basic requirement for both types of flooring is to be resistant to external influences. The physical and mechanical requirements for decorative outdoor flooring are not as high, but however, they must have some basic features, plus the two stated above, the floorings should be long-lasting and should not change their original shapes and sizes, retaining the initial vision over time. 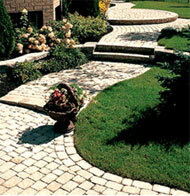 Among the largest groups are those of natural stone – marble, limestone, etc. They are stable and durable over time, but require special alignment and assembly joints and are not likely to have repeatability of stone. Terracotta and granite enter into another large group of external surfaces. They come in many colors and variations, but require special grouts to compensate for the heat expansion. A separate, but still very popular group of external floorings are those of natural wood. These include teak wood, larch and other expensive exotic woods. The natural wood takes moisture and is not very durable to ultraviolet radiation. For this purpose, it is necessary to treat the wood with mineral oils, linseed oil or varnish. Besides the common wood flooring types, wood can be used as trail of tiles with grass strips in the green area. This creates a very beautiful decorative and aesthetic effect. We often use this for the construction and design of playgrounds.